The Boston City Council has passed the Truck Side Guard Ordinance, the first of its kind in the nation. 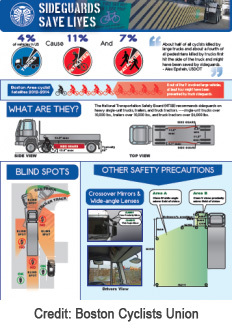 The ordinance will require side guards, convex mirrors, cross-over mirrors, and blind-spot awareness decals on all city-contracted vehicles over 10,000 pounds (or for tractor-trailer trucks with a combined weight over 26,000 pounds). This ordinance passed quickly and unanimously last week. Mayor Martin J. Walsh, At-Large Boston City Councilor Ayanna Pressley and the Boston Cyclists Union, a non-profit advocacy group, filed the proposed ordinance on September 9th; it was approved by the council on Oct. 29th. It takes effect 180 days after passage and applies to all future contracts. Side guards are meant to reduce injuries to drivers, cyclists and pedestrians by closing off the space under a truck. The National Transportation Safety Board recommended a side guard protocol last April, reporting that large truck side impacts comprised of 15 percent of fatal two-vehicle collisions between large trucks and passenger vehicles in 2011. In the United Kingdom, mandated side guards on large trucks reduced cyclist deaths by 61 percent and serious injuries to cyclists by 13 percent, according to a Transport for London study. Boston’s goal is to protect cyclists, pedestrians and other drivers, but cyclists have faced especially hard road conditions in recent years. Since 2010, 11 cyclists have been killed in Boston, seven in bike accidents which involved a truck or bus, according to city figures. Injuries to cyclists from other causes have also increased, even though the city has developed Boston’s cycling infrastructure dramatically in recent years. The City continues to expand bike lanes and to work on cycle track projects which will put a physical barrier between cyclists and traffic. Others may soon follow Boston in passing a truck side guard ordinance. Lawmakers in New York have proposed legislation that would mandate side under-ride guards on trucks, tractors, tractor trailers and semi-trailers. In Massachusetts, Somerville, Cambridge and Newton are also considering ordinances. Elsewhere, Portland and Washington D.C. also have proposed legislations or restrictions. Pilot Program. Boston began looking at truck side guards in 2013, when the Mayor’s Office of New Urban Mechanics and the city’s Public Works Department undertook a municipal pilot study of truck side guards. Inspection. Vehicles associated with an awarded city contract will be inspected for side guards by the Inspectional Services Department and issued a permit, certifying the vehicle for 2-years. Enforcement. Businesses will face a fine for vehicles which are not in compliance. The fines start at $100 for the first offense and rise with repeated violations to potential contract termination. The Boston Police Department will assist with enforcement. Other City Offices. The Boston Transportation Department and Boston Bikes will assist with education, content expertise on best practice and as the point of contact for constituent reporting. Exemptions. There are some exemptions, such as for trucks which are used exclusively for snow plowing or emergency vehicles. Read more about Boston’s new truck ordinance. The Boston personal injury lawyers at Breakstone, White & Gluck have over 100 years combined experience representing injured cyclists and pedestrians. For a free legal consultation, visit 800-379-1244 or 617-723-7676 or use our contact form.